The Soil is Alive! Practicing our theme for the year, several feet of compost are added to each new bed and mixed with the existing native soil. In this case, we are using fresh leaves collected by the local municipality, which will be mixed until it turns a rich black color. These beds are the start of the newest section of garden around our new house site. 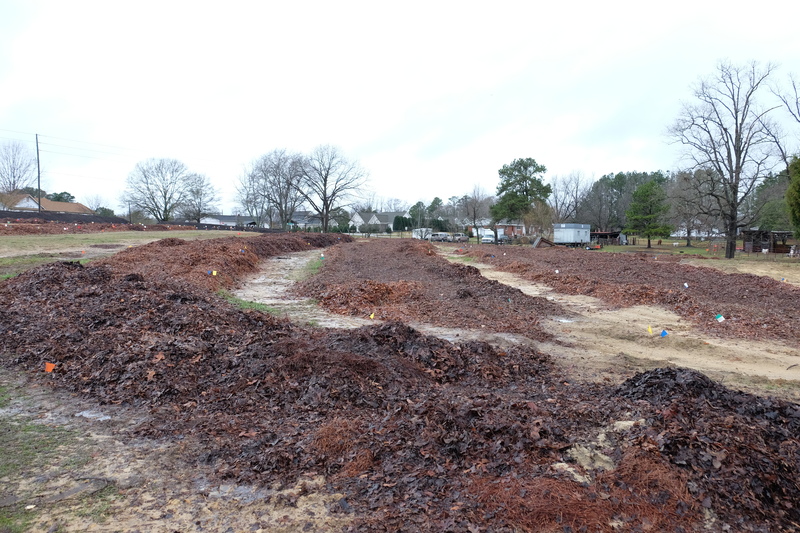 These new berms just installed by Sauls Road are composed of older compost, also mixed 50/50 with our native soil. Planting began this week, so be sure and notice how fast these grow in well-prepared soil, when you visit us on future Open Nursery and Garden days. Will you be testing the pH of your new beds? and if so, when in the process will it be done? Thank you for a reply. Great question. The soils was tested this summer and organic nutrients were subsequently added. We’ll test again next summer. What are you planting on the berms? An array of mixed shrubs (mostly evergreen) to reduce road noise. Lots of cryptomeria, clumping bamboo, hollies, camellias, fatsia, mahonia, etc. Great question. One flag is placed where the new plant will be planted. Each color represents the color that the plant presents in the landscape. Yellow shows plants with either yellow foliage or yellow flowers…green, red, blue, etc. 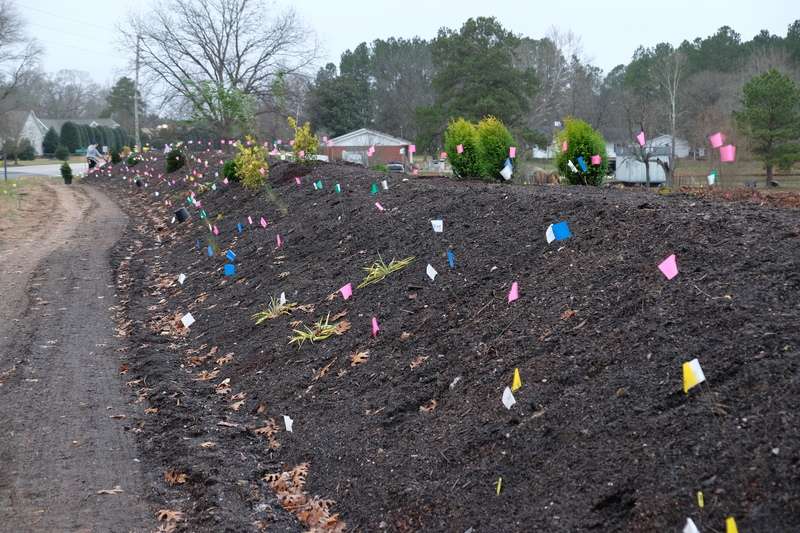 Using the mature sizes of each plant, pink flags are placed to show the outer edge at maturity. If a plant has a mature spread of 12′, then a pink flag is placed 6′ in each direction from the center. This ensures the plants are installed on the proper spacing and will never need any pruning. Folks who routinely prune shrubs either didn’t plan well, selected the wrong plants for the space, or didn’t have the correct mature plant size.